After all the red meat and gravy on the table the past few weeks, it’s a nice change to serve seafood. When buying shrimp, choose raw, not precooked, so yours don’t end up overdone and tough. Bags of frozen large or jumbo size are economical. You can use half a bag and keep half in the freezer. When selecting fish, be sure to choose wild-caught, which is not heavily processed, nor does it contain antibiotics or unnatural food that can taint its flavor. salmon cakes with peach salsa Fresh salmon is quite expensive and best prepared poached or grilled. When making my tasty salmon cakes, use inexpensive wild-caught canned salmon, which flakes easily, and the edible crushed bones provide a big burst of calcium! This makes four nice size cakes you can serve with sides or pop them on a bun with lettuce, sliced red onion, and horseradish sauce along with the peach salsa. Very flavorful. I made these the other night. Jerry ate two and I ate one, so I saved the last one for my lunch the next day. Wow, so good heated up in the toaster oven at 400° for 10 minutes. Prepare salsa. Drain and dice peaches. Combine in a small bowl with scallions, lemon juice, jalapenos, salt, and sugar. Stir in cilantro and set aside. Heat heavy skillet over medium high heat. Thoroughly drain salmon and remove dark skin if desired. Flake salmon and crush bones with a fork. Mix in all remaining ingredients except oil, butter and Panko. Place Panko in a flat bowl. Line a platter with wax paper. Use your hands or ½-cup measuring cup to form at least four cakes about 1-inch thick, carefully coating them with Panko and placing on the platter. Cakes will be very soft. Place olive oil and butter in pan, swirling to cover bottom. When shimmering, transfer cakes carefully to pan. Fry 3-5 minutes on each side till golden brown. Serve with peach salsa and sour cream on the side. TIP: Panko breadcrumbs can be found in the ethnic section of your grocery store. The brand name is Sushi Chef. heavenly sweet coconut crunch shrimp This delicious shrimp is not only good, but it’s also pretty low in calories. Serve with sweet and sour or sweet chili sauce, rice, and a green veggie. Place cereal in a sealable plastic bag. Remove as much air as possible before sealing. Using a meat cleaver or heavy can, crush cereal through the bag. Add coconut, Panko, chili powder, garlic powder, salt, and pepper to bag. Seal and shake to mix. Transfer to a large plate and set aside. Pat shrimp very dry with paper towels. Beat egg and toss shrimp to coat. One at a time, shake excess egg off shrimp and place in crumb mixture, flipping and patting till well coated. Space evenly on baking sheet. Bake 10-12 minutes until coating is light browned and crispy. Serve immediately. deb’s clam casserole My college roommate used to make this for us—a cheap but filling meal, delicious served with stewed tomatoes and toast points. This recipe makes plenty for four. Preheat oven to 350°. Spray the inside of a large casserole dish with cooking spray. In a large bowl, mix all ingredients thoroughly, ending with the butter. Pour into baking dish. Bake 1 hour until golden brown on top and a toothpick comes out clean. While casserole is baking, place all ingredients except the cornstarch mixture and salt and pepper in a saucepan. Cover and bring to boil over medium high heat, reduce to a simmer, and cook for about 8-10 minutes till vegetables are soft. Stir cornstarch mixture well and add to pan, stirring constantly till sauce thickens. if too thick, add a bit more water. Season with salt and pepper to taste. Cover and simmer another two minutes till cornstarch is thoroughly cooked. 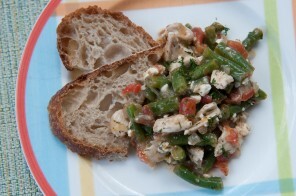 Serve alongside clam casserole with English muffins or toast. Nice stick-to-your-ribs winter meal! my baked stuffed white fish (cod, flounder, haddock, hake, pollock, sea bass, or sole) with my seafood stuffing I buy whatever white fish is on sale or marked-down frozen as long as it is fresh-smelling and firm to the touch (never be afraid to ask the person at the fish counter to let you smell the fish before you buy it). White fish from the ocean is usually wild-caught, so you don’t have to be concerned about that. White fish can be used in chowders, breaded and fried, or baked. Avoid oily fish like mackerel, herring, salmon, or bluefish, which need to be prepared differently. My stuffing includes “imitation” crab meat, a product made from ground fish called surimi, which is purified and flavored, so it is purely protein and one I do not object to using in some of my recipes as it is very flavorful and economical. [http://en.wikipedia.org/wiki/Surimi] If you prefer, you can use real crabmeat. Prepare either a 9-inch square pan or two individual au gratin dishes with cooking spray. Drop 1 Tbs butter into individual dishes or 2 Tbs into pan. Place in oven to melt. Remove pan/dishes from oven and place half lemon juice into them. Cut the fish into pieces to fit the dishes or pan. Sprinkle remaining lemon juice on top, lemon zest, salt, and pepper. Divide seafood stuffing over tops of the fish, and dot with remaining butter cut into small cubes. Bake from 10-15 minutes depending on the thickness of the fillets. Serves 2.
seafood newburg Use lobster, white fish, or crab—even imitation crab or lobster by Louis Kemp. 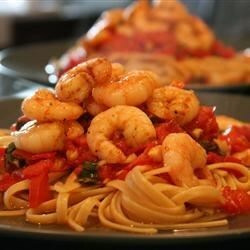 Make this sauce and placed cooked seafood in it for a few minutes to warm through. Be careful. Do not boil! The sauce is delicate and will break easily if boiled too hard. Simmer only. Sorry for the unconventional presentation of this recipe. It is the only one I have and have followed for years. Melt a half stick of butter in a skillet. Add 2 Tbs dry sherry and 1 Tbs bourbon. (If you need to cook raw haddock or shrimp, you can add it here.) Stir, cooking for 2 minutes. Remove fish, and add 1½ cups milk, cream or half-and-half, bring to a boil and reduce heat. Stir in another Tbs sherry, 1 Tbs bourbon, and ¼ tsp freshly ground nutmeg. Whisk in 2 egg yolks OR 1 Tbs cornstarch mixed with 1 Tbs water, a dash of cayenne, and a ½ tsp paprika. Add your fish, including cooked lobster, back into pan. Cook 3 minutes or so. Keep warm. Serve over rice or toast. seared scallops with brussels sprouts and bacon Scallops can be very dear, but when they are on sale, 3-4 scallops to each diner should be plenty as they provide some pure protein and minerals from the sea—a winning combination. Ask for “dry” scallops if they are available. They haven’t been processed or plumped up with salt water, so they leak less liquid when you are cooking them. You also get more meat for your money. You can easily double this recipe for more diners at the table. Blanch sprouts in a 2-qt. saucepan of boiling salted water, uncovered for 3 minutes, then drain. Cook bacon in a microwave or a heavy skillet over medium heat till crispy; transfer to a small bowl, reserving fat. Add 2 Tbs broth and 2 Tbs water to skillet and bring to a simmer, scraping up brown bits. Add butter, salt, sugar, pepper and blanched sprouts and simmer covered for 4 minutes. Remove lid and cook over medium high heat stirring occasionally till liquid is evaporated and sprouts are tender and golden brown, about 8 minutes. Stir in bacon and remove from heat. While sprouts are cooking, pat scallops VERY dry and season with salt and pepper. Heat oil with 1 tsp bacon fat in a 6-inch skillet over medium high heat till hot but not smoking. Place scallops to sear, turning once till golden brown and cooked through, 4-6 minutes TOTAL (that means 2-3 minutes per side). Do NOT overcook. Transfer to a platter and cover loosely with foil to keep warm. Pour off and discard fat remaining in the 6-inch skillet. Add remaining chicken broth and simmer, scraping up brown bits for 1 minute. Stir cornstarch into remaining 1 sp water and stir into pan with any juices that have accumulated on the scallops plate. Simmer 1 minute, stirring, remove from heat and stir in lemon juice and salt and pepper to taste. Serve brussels sprouts topped with scallops and sauce.